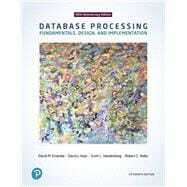 by Kroenke, David M.; Auer, David J.; Yoder, Robert C.; Vandenberg, Scott L.
For undergraduate database management courses. Database Processing: Fundamentals, Design, and Implementation, 15th Edition, is a thorough and modern look at database processing fundamentals that’s designed to get readers straight to the point. This 40th anniversary edition has been refined and updated to reflect contemporary teaching and professional workplace environments and methods, address the latest software, and expand upon new and emerging developments in the database processing field – such as cloud computing and Big Data. David M. Kroenke has more than 35 years’ experience in the computer industry. He began as a computer programmer for the U.S. Air Force, working both in Los Angeles and at the Pentagon, where he developed one of the world’s first DBMS products while part of a team that created a computer simulation of World War III. That simulation served a key role for strategic weapons studies during a 10-year period of the Cold War. Working independently, he also developed a new data modeling language called the semantic object model. Kroenke has extensive experience in the business sector, and has held positions at Boeing Computer Services, Fred Brooks, Microsoft Corporation, and Logicon Corporation. From 1973 to 1978, he taught in the College of Business at Colorado State University, and published the 1st edition of Database Processing in 1977. He has worked as an editor and author developing texts, videos, and other educational products and seminars, and in 1982, was one of the founding directors of the Microrim Corporation. Kroenke has continued consulting and writing. His current interests concern the practical applications of data mining techniques on large organizational databases. Kroenke is married, lives in Seattle, and has two grown children and three grandchildren. David J. Auer has more than 30 years’ experience teaching college-level business and information systems courses, and for the past 20 years has worked professionally in the field of information technology. Auer is the coauthor of numerous textbooks, including five editions of Database Processing. From 1994-2017, he served as the Director of Information System and Technology Services at Western Washington University’s College of Business and Economics, and remains at the University as a Senior Instructor Emeritus as he continues his writing projects. Scott L. Vandenberg has over 25 years’ experience teaching computer science to college students in computer science and business programs. Before completing his PhD, he worked for brief periods at Standard Oil Research, Procter & Gamble headquarters, and IBM Research. He taught for two years at the University of Massachusetts-Amherst, before joining the faculty at Siena College in 1993. He has also published several papers relating to introductory computer science curricula and is currently a co-principal investigator on a multiyear NSF grant to develop methods to broaden participation and increase retention in computer science. Vandenberg is married, lives in Averill Park, New York, and has two children. When not playing with databases, he enjoys playing ice hockey and studying medieval history. Robert C. Yoder began his professional career at the University at Albany as a systems programmer managing Unisys and IBM mainframes, along with Unix servers. He became the Assistant Director of Systems Programming, gaining over 25 years’ experience as a programmer and technical manager. Bob took a two-year break from systems programming to work as a senior systems analyst at Phoenix Data Systems in Albany, New York, where he worked with a team to develop an innovative 3-D solid modeling system using a data structure called octree encoding that can represent the interior properties of objects. This work became the inspiration for his PhD dissertation on 3-D geographic information systems. Bob and his wife live in Niskayuna, New York, with their two children. He enjoys traveling, hiking, and walking his dog. Bob would like to dedicate his portion of the textbook to the memory of loved ones who passed away recently: Dorothy Yoder, Laurie Gorski, and canine companion Robbie.